To get a layered look to your cards put your Spellbinders dies to good use...here's how! 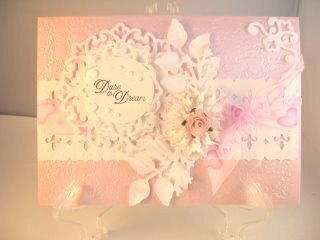 If you enjoy die cutting then Spellbinders are something well worth trying. The only drawback is the cost as they are quite expensive. And because of the cost involved they need to be stored and cared for carefully. 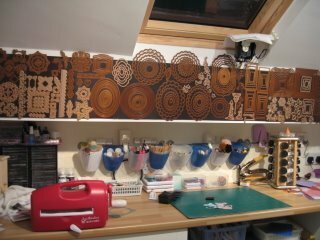 I have attached some of mine to magnetic sheets and adhered them to the wall so they are always on hand over my work area ready to be used. Others I store on the sheets in their original package and keep in a file system in a plastic box. That way I can flip through them and see instantly which set it is that I want to use. They are a thin metal die that can cut through lots of different materials... card, paper, fabric, felt, chipboard, crafting metals and much more. They help you to achieve a really good look to all your matting and layering and to create the all important toppers to give your cards the much needed focal point. That is the first in a series of videos to show you how to get the most from your purchase. I have also added a "suggested list" of dies that you may like to consider to start you off.... and then more videos to help you make that suggested set work harder. Faux Nesties will show you how to get more from any of your Labels dies. There are many different dies. "Borderabilities" "Embossabilities" "Impressablities" "Edgeabilities" and "Nestabilities" plus others and they can all create some magical effects. They come with smooth and scalloped edges and the "Nesties" are called so because the shapes all nest together. By incorporating the different sizes together, frames can be made with a thick or thin rim. The come in sets of 5/6 or 7 dies and you can buy heart shapes, snowflakes, flowers, stars, paisley patterns, octagons, squares, circles, ovals and many, many more. You can also emboss with the dies, and for this you will need the "Tan Embossing Mat"
Look online for some really good deals and choose carefully. I have bought a lot of mine from America and despite the postage they still work out cheaper than buying in the UK craft shops. New patterns, sizes and styles are added to the selction regularly. Make sure it is a die that you will use a lot, the last thing you want is a die that sits there doing nothing after costing you so much. Pyramage and the Invertage pages to give you some ideas on how to put your Nesties to work.